The country received a score of '40' in the 2018 Corruption Perceptions Index produced by Transparency International, failing to improve on its ranking from the previous year. Levels of corruption in Argentina have significantly improved in recent years, watchdog group Transparency International underlined in its annual corruption report Tuesday, although the country failed to improve its ranking of 85th place as in previous years. Argentina received a 40 on the group's 'Corruption Perceptions Index,' where 100 is very clean and zero is very corrupt. That was a slight improvement from 2017's score of 39, yet Argentina failed to improve on its ranking from the previous year. Nonetheless, the nation still ranks well below the the average "flawed democracy," in part thanks to improvements in its ranking witnessed in the two preceding years. 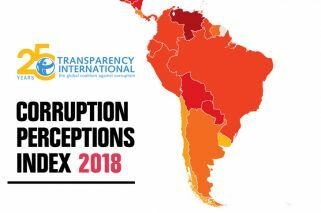 The Corruption Perceptions Index for 2018 showed more than two-thirds of countries scoring below 50. Full democracies scored an average of 75 on the corruption index, flawed democracies averaged 49, and autocratic regimes averaged 30, the organisation said. In the headline takeaway from the report, the United States slid four points on the previous year, dropping out of the list of top 20 countries for the first time since 2011. Argentina’s score has improved five points since 2012, making it one of just 20 nations that have significantly improved their scores since 2012. Sixteen nations have declined significantly in that same timeframe, including Chile, which dropped from 72 to 67. Brazil dropped two points since last year to 35, also earning its lowest CPI score in seven years. 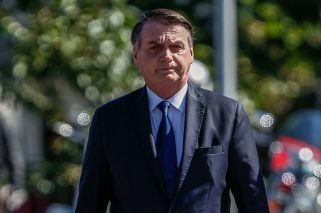 Alongside promises to end corruption, the country’s new president Jair Bolsonaro has made it clear that he will rule with a strong hand, threatening many of the democratic milestones achieved by the country, Transparency International wrote in a press release. Countries like Hungary and Turkey are growing more corrupt as they become more autocratic, and threats to the American system of checks and balances have knocked the United States out of the top 20 "cleanest" countries, according to a closely watched annual survey released Tuesday. Hungary dropped eight points and Turkey nine over the past five years, to scores of 46 and 41, respectively. Venezuela’s rating was unchanged from 2017, and has not decreased significantly in the past five years. With a score of 18, the country is tied with Iraq for 168th place. Low ratings reflect the "deterioration of rule of law and democratic institutions, as well as a rapidly shrinking space for civil society and independent media," the organization said. "With many democratic institutions under threat across the globe –- often by leaders with authoritarian or populist tendencies -– we need to do more to strengthen checks and balances and protect citizens' rights," TI's managing director Patricia Moreira said. Argentina's own local branch aligned with Transparency International is non-profit foundation Poder Ciudadano.